A wizened master builder (right) calks a partially completed hull with breadfruit gum before his workers stich wooden strakes to its sides. 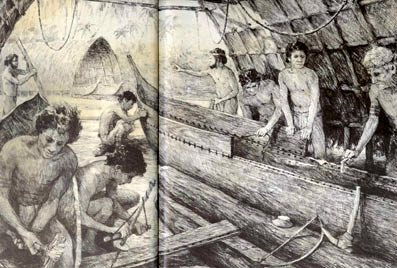 At the left, a man shapes a second hull with a stone adz, while his companion uses a shark's-tooth bit to bore holes in a strake. Finishing tools included the small pumice stone and bow-shaped rasp of stretched sharkskin in the right foreground. The canoe's twin hulls, their sides sealed with protective varnish made from nut oils, are lashed to the crossbeams that hold them parallel and support the plank deck. A voyaging canoe might be up to 100 feet long and - with its deck, thatched deck house, masts and rigging in place - might weigh 10 tons.